These are great cold for lunch boxes, a picnic or for parties as a snack - or warm as a main course. Soak the dry white bread in water for 10 minutes. Then press it in your hands to get as much of the water out of the bread as you can. 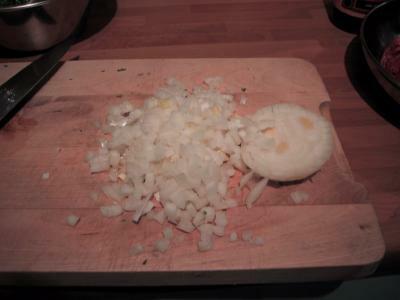 Chop the onion into fine cubes, chop the parsley finely and mix all the ingredients together. You can either form little meatballs out of the mixture and deep-fry them or make hamburger-style patties which you can either pan-fry or barbecue. 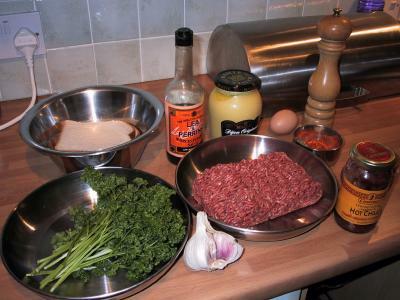 Here are our ingredients (with the onion hiding behind the hot chilli paste). 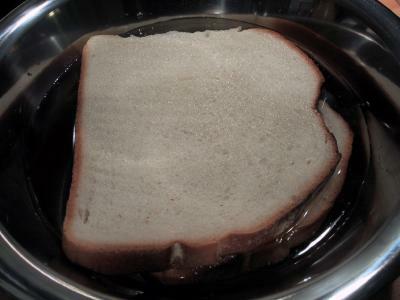 Soak your two slices of white bread in water (best use dry old bread for this). 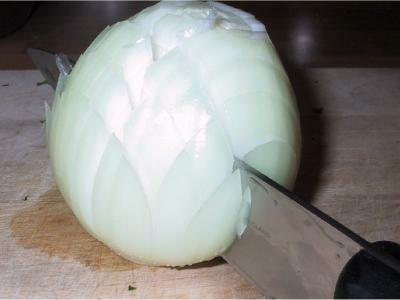 To finely cut the onion, cut slices about 3 mm wide into the onion from the top. Don't cut all the way to the bottom but leave about half a centimetre as shown in the photo. 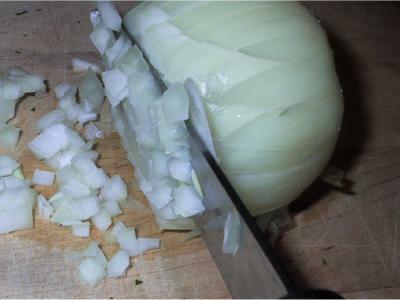 Then turn the onion by 90 degrees and cut another set of slices into the onion, again stopping half a centimetre short of the base. 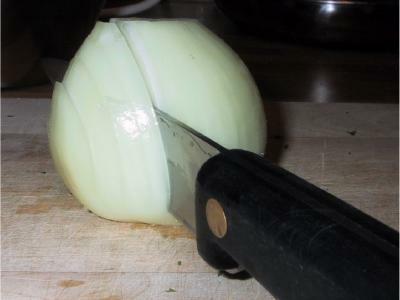 Now flip the onion on its side and cut off 3 mm slices which will turn into nice cubes. Use the base that doesn't have the vertical cuts for something else. (Best wrap it in cling film and put it in the fridge). Now squeeze the bread to get as much water out of it as you can. ... all the ingredients are evenly distributed. Then form patties from the mixture. The size and shape is up to you. 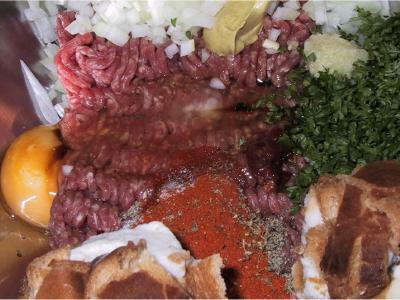 You can either form little balls and deep-fry them or form patties and pan-fry them as shown in the next picture. 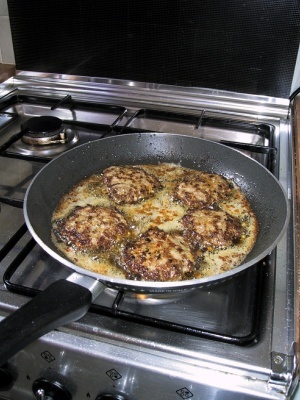 When pan-frying, use a mixture of olive oil and butter (50-50). 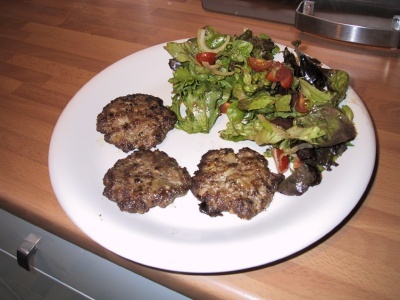 Don't heat up too much as you want the patties to be cooked thorough but not burned on the outside. The photo on the left shows how much fat you should use for frying and what it should look like - the foamy surface indicates you've got the right temperature. You can serve them with just a side salad. 10 Look's good and very simple, I will be making these later and compliment with potatoes salad. 10 As far as I'm concerned no-one could make like my gran, she would make & freeze them, & when I visited she would give me a doz to take home but I would eat them frozen as they thawed.&#128578&#128578&#128578&#128578&#128578&#128578&#128578&#128578&#128578&#128578 . 10 Plese keep giving us all these yummy recipies, they come from your heart and soul. Thanks. 8 I worked (as a ptrsay maker) in a German eatery for a few months and I used to love all these dishes! Yum! Perfect for cold weather too!By the way, I have some (free) goodies from my recent trip to Lebanon if you are interested! 10 Great instructions! Nice to eat! 10 It's really German, not Dutch, most things German are called Dutch in America, because Deutsch could not be pronounced well, see Pennsylvania Dutch, are really Pennsylvania Deutsch. And, it's not Danish either! 9 Nice with a tomato and oregano sauce. 8 Is this really a typical Dutch Meatball or Frikadellen? 10 Hat wirklich geholfen. Danke! 7 I loved your pictures as well as the amazing recipe!! I didn't measure but all in all AMAZING!!!! 9 What do we do with the garlic --crush,chop or leave it with the hidden onion! 10 Job well done! It's very easy to follow! 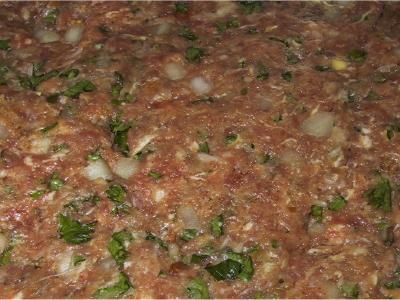 10 Thank you very much this is a great recipe. 10 Fantastic. I love these meatballs, but I add ground almonds instead of bread as I cannot eat bread. 10 thank you for this lovely frikadelle. 8 The Danes make these with minced pork. 10 Try frying up a whole batch let cool and deep freeze. Take out as needed and voila with mash and some veg supper is ready in minutes. 10 Awsome my daugter makes this as her specialty! is very easy!! 10 Very nice in a chilli sauce, on a bed of boiled Rice, with pepper and pineapple thrown on before serving.. Yummy!!! 10 THIS WAS ABSOLUTELY THE BEST FRIKADELLEN. 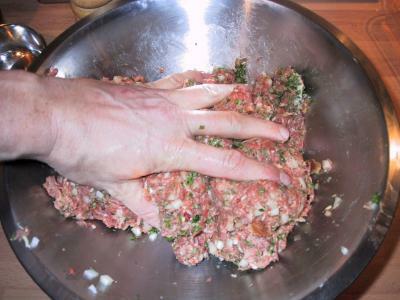 I'M AN AMERICAN LIVING IN GERMANY FOR PAST 7 YEARS AND THE FOOD SCARED ME TO DEATH SO MY FRIENDS MOM MADE ME A FRIKADELLEN AND I REALLY LIKED IT BUT I LOST HER RECIPE AND HAD TO GO ON-LINE IN SEARCH OF A RECIPE. NOT TO TAKE AWAY FROM MY FRIENDS RECIPE, THIS ONE IS SOOOOOOOOOOOO MUCH BETTER. THANKS SO MUCH !!! 10 very nice recipe for a family quick and easy instructions great!! 10 I have been searching for this recipe for ages. Easy to prepare and very delicious. I fry up my patties & make my patties & serve them on a 3-inch long hot biscuit with red relish & hot mustard. Yummy! 9 Fabulous pictures. Even a complete novice could follow it. 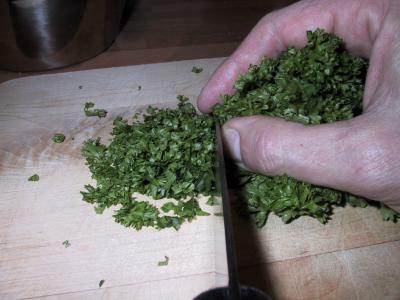 I am a bit worried about your fingers while chopping the parsley though.